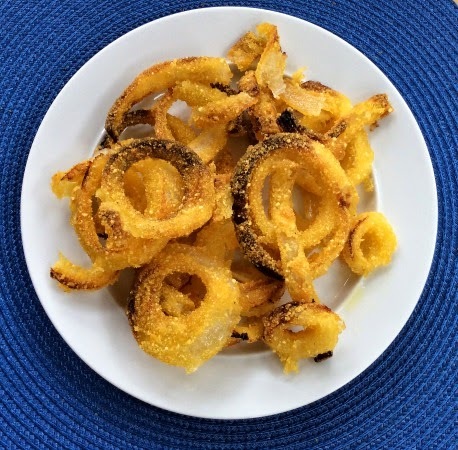 These GF/DF Onion Rings are my healthier oven baked version of the traditional fried ones. These are made in the oven, not the fryer. They are crispy on the outside, tender on the inside and never soggy. A wonderful accompaniment to your summer barbecue! Enjoy! Make a vegan buttermilk by combining the non-dairy milk with the lemon juice. Place the onion slices in a bowl, pour the buttermilk mixture over the top and let them soak for 1 hour, refrigerated. Preheat the oven to 450 degrees and line two baking sheets with parchment paper. Combine almond meal, rice flour, salt, pepper, garlic powder and cayenne pepper. Divide the crumb mixture in half, reserving the second half for the second tray. Dip each soaked onion ring into the crumb mixture to coat well and place on baking trays. Lightly spray with olive oil. Bake 12-15 minutes or until golden brown and serve immediately. These onion rings look wonderful. pinning to try. found at tickle my tastebuds linky. Have a great week. Yum! These look and sound great! I'm definitely trying. Pinned! these look great, I have to try these, I know my hubby would be so pleased. I love onion rings. What a challenge to make them allergy free, but it looks like you were successful. They look yummy enough that my mouth is watering. I better go eat some breakfast! Smiles! This sounds like a great way to make onion rings healthy! Thanks for sharing with Foodie Friends Friday! I love your healthy recipe for these awesome Onion Rings! Thanks so much for sharing your awesome recipe with Full Plate Thursday. Hope you are having a great week and come back soon!